2010 Handmade Olympics – Vote Now! Voting is now open for the 2010 Handmade Olympics! 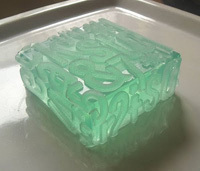 You can vote for cool designs such as this typography soap by Soapylove that is up for Favourite Handmade Goodie with an Innovative Design (event 1). Ultimate Organic Soap’s French Milled Vanilla Bean and Rose Petal Soap has been nominated for Favourite Handmade Goodie That Inspires Loveliness & Wellness (event 4). Voting closes on Wednesday, February 17 at 5pm.